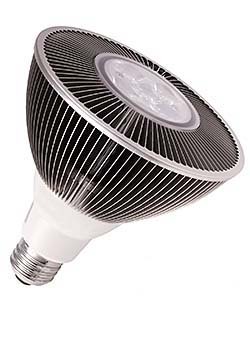 The 30W Uphoria LED PAR38is a PAR 38 replacement lamp, offering 1,880 lumens in a 20-degree beam angle. Uses a Cool-Blade heat sink design, with high-density aluminum cooling blades to draw heat away from the chipsets. Dimmable, with a 3000K warm white color temperature.